All the comfort of a loaded baked potato bowl, but with less carbs! You’ll be amazed at the flavor! Normally, when you eat a loaded baked potato, you are consuming a lot of carbs. Russet potatoes can have 67 grams of carbohydrate in a single large potato! Add in the fat PLUS the carbs, and you can have trouble with a capital T.
What is a loaded baked potato? It is generally a baked russet potato, or sometimes red potatoes, filled with sour cream, cheese, bacon bits and onions. A sweet potato can also be used for a different twist. What food goes well with loaded baked potatoes? They are commonly served in steak houses, along side a juicy steak. Or with fried chicken like at the chain fried chicken restaurant. Loaded baked potatoes can also be a meal unto themselves. 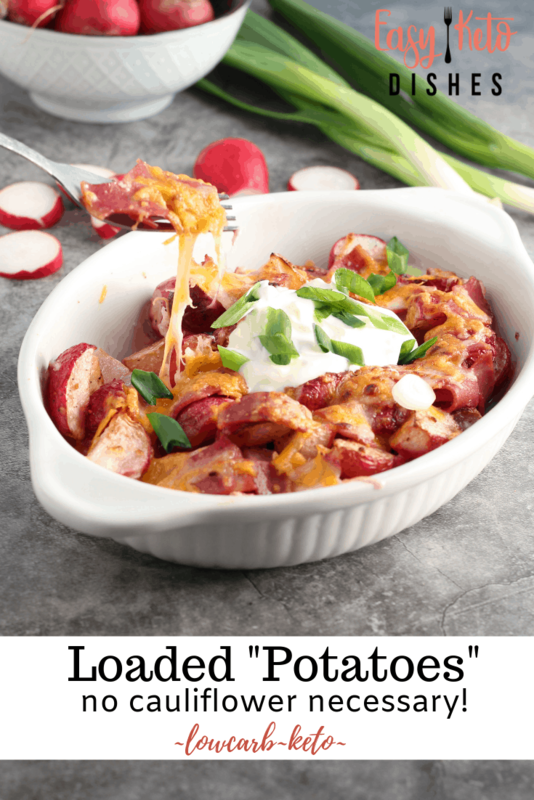 What is a loaded baked potato bowl? This is when you would take mashed potatoes, and add the sour cream and other fixings to it. Also called a loaded potato casserole, it gets the name “bowl” as it’s served in, well…a bowl. It can also refer to potatoes that are cut up, baked or fried, and topped with all that goodness. 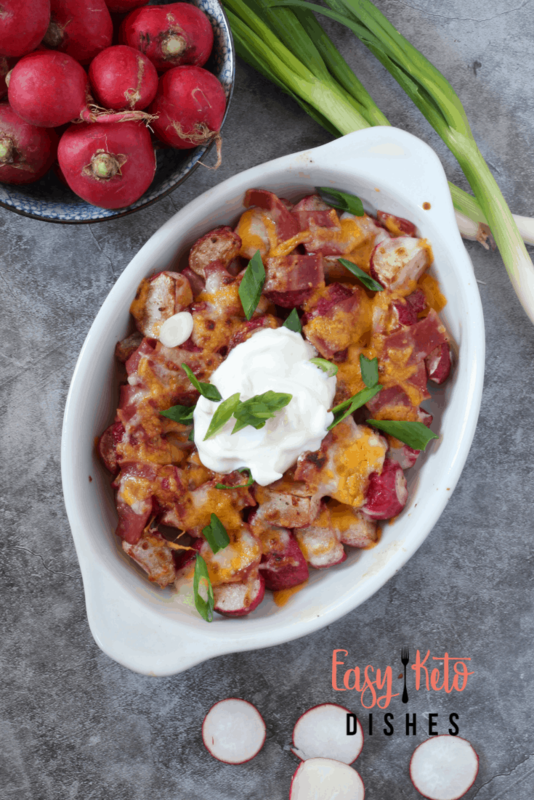 This loaded baked potato bowl has all the flavor, all the comfort, but a LOT less carbs! 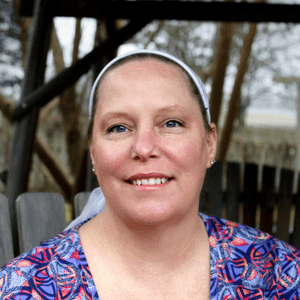 What is different? We are substituting out the potatoes for a vegetable that is far lower on the glycemic index. 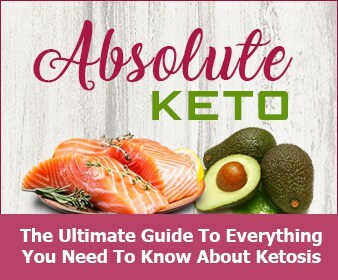 One that has riboflavin, loads of dietary fiber, calcium and only 2 net carbs per cup! Can you guess what we are going to use? That’s right. Round radishes. Little red globes of peppery goodness that make the best potato replacement. 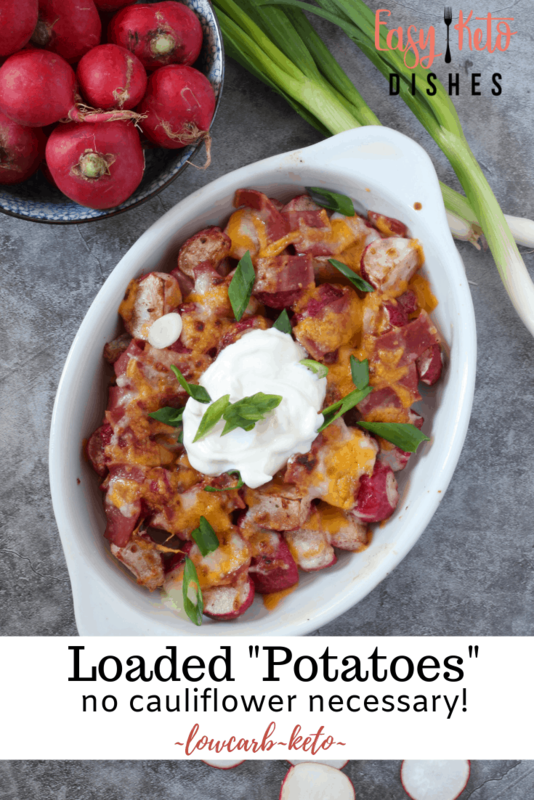 You can easily find a loaded baked potato recipe with cauliflower, but I love how radishes make a great low carb potatoes replacement. They hold up well under cooking and baking, and radishes don’t get mushy like cauliflower can. 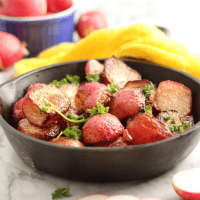 Radishes can have a sharp, peppery bite, but it mellows to a sweeter flavor when cooked. 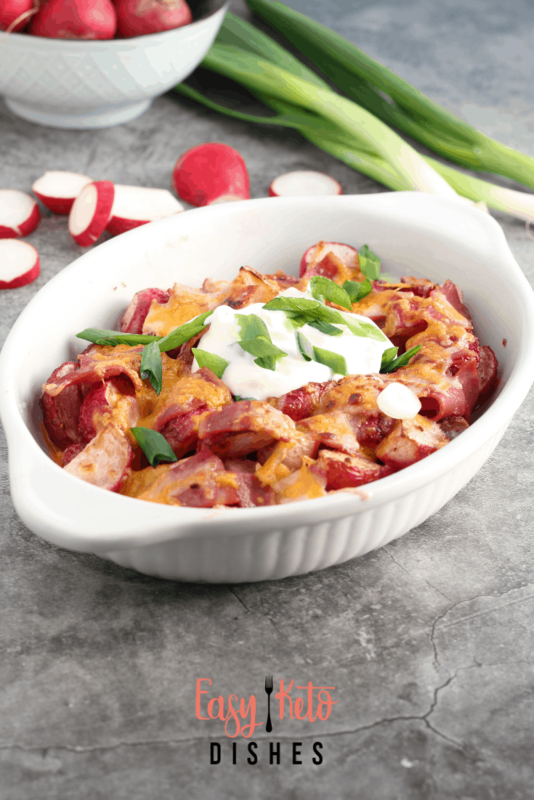 Let’s get our low carb loaded baked potato bowl on! This is a great side dish recipe to go with another protein, such as chicken, burgers, or steak. It can also stand alone as a meal, if you would like. Wash and trim the ends off the radishes. Cut into quarters. In a large skillet, heat the avocado oil on medium high heat. Add the radish quarters, and season with salt and pepper. Stir to coat and allow radishes to cook and crisp up on the edges. Meanwhile, preheat the oven to 400 degrees F, and grease an 8×8 baking pan with butter or cooking spray. Once radishes are fork tender and a bit crispy on the edges, stir in the garlic and sautee 1 additional minute. Remove to baking pan and set aside. Using the same skillet, cook the bacon strips to medium crisp. Remove to a paper towel to drain, if necessary and cut into strips. Top the cooked radishes with the bacon bits, and 3/4 cup of each of the cheeses. Bake in the oven for 15-20 minutes, until cheese is golden brown and bubbly. Remove from the oven, and allow to cool for 5 minutes before serving. Serve into 4 bowls, and sprinkle remaining cheese, green onions and top with sour cream before serving. What is your favorite comfort food? 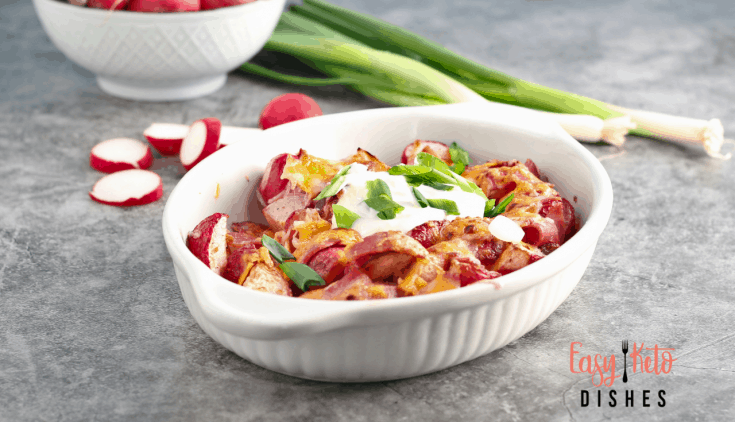 Will you try this low carb version of a loaded baked potato bowl? Be sure to let me know what you think! In a large skillet, heat the avocado oil on medium high heat. Add the radish quarters, and season with salt and pepper. Stir to coat and allow radishes to cook and crisp up on the edges. Meanwhile, preheat the oven to 400 degrees F, and grease an 8x8 baking pan with butter or cooking spray. Remove from the oven, and allow to cool for 5 minutes before serving.Serve into 4 bowls, and sprinkle remaining cheese, green onions and top with sour cream before serving. Just love this…didn’t even know it was radishes! A treat! 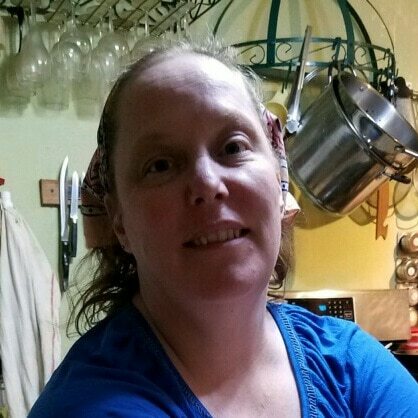 I love a one dish, or veggie, meal! This looks like a total crowd pleaser. I had no idea these were radishes! 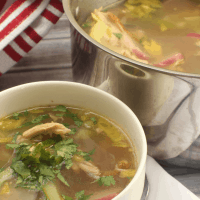 I made this for my husband who is eating low carb at the moment and he loved it! I love radishes! 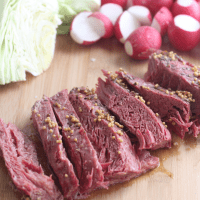 I can’t wait to give this low carb dish a go. The toppings have me drooling!